Days of Our Lives (DOOL) spoilers tease that Eric (Greg Vaughan) will get a visit from Jennifer (Melissa Reeves) next week. He’s busy sulking at the farmhouse, but Jen will think it’s time for Eric to come home. She’ll make an impressive speech about how much Eric’s friends and family members miss him. Of course, Jennifer knows Eric could use the support of his loved ones as well. Watching Nicole (Arianne Zucker) walk away was one of the hardest things he’s ever had to do. Eric still isn’t entirely sure of Nicole’s motives, so that’ll make his heartbreak even tougher to bear. Jennifer might urge Eric to reconnect with Brady (Eric Martsolf) and make amends. Since Nicole won’t be in the picture anymore, Jen may argue that at least something good could come out of it. That’s our Jennifer! Always trying to make lemonade out of lemons. However, DOOL spoilers state that Eric won’t be interested in peace. When Nicole revealed she was breaking up with him, Eric had a hunch that Brady might’ve threatened her. Nicole denied it, but Eric’s suspicions will slowly grow stronger. Once he makes it back to Salem, Eric will be convinced that Brady’s to blame. 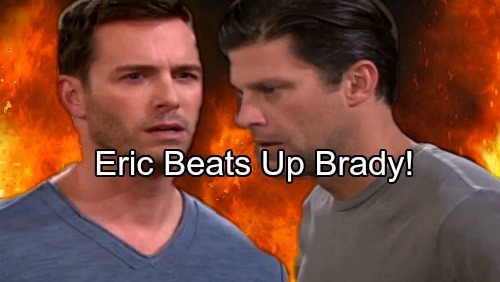 Days of Our Lives spoilers say Eric approach Brady and angrily demand the truth. Brady’s reaction should tell Eric what he needs to know, but he’ll push him to confess anyway. Eric will want the monster to admit that he forced Nicole to dump the man she loves and leave town. Brady probably won’t pass up the chance to gloat. After some prodding, Brady may blurt out that Eric’s right. He certainly won’t be sorry that he made Nicole and Eric suffer. Days of Our Lives spoilers indicate that Eric will really lose it! Brady cost him the love of his life, so he’s understandably upset. A furious Eric will raise his fist and throw a fierce punch. Days spoilers say Brady will face a painful blow, but it’ll be nothing compared to the blow Eric received. Brady could take punches all day and it would still be worth it to him. Seeing Eric’s sorrow will give him great satisfaction. It sounds like this brother battle will rage on for a while. We’ll give you updates as other Days news comes in. Stick with DOOL and don’t forget to check CDL often for the latest Days of Our Lives spoilers, updates and news.